Each summer, Drum Corps International groups offer students and fans a unique opportunity to learn all aspects of corps technique—taught by the members and staff who bring drum corps to life on the field. Coinciding with some of the biggest events of the summer, DCI's Live Learning series takes place at select Premier Events throughout the DCI Tour. 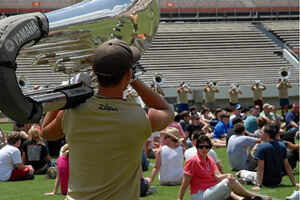 These educational opportunities let attendees get up close and personal with some of the top corps of Marching Music's Major League, giving them a small taste of what the drum corps experience is all about. Many corps will also present educational events outside of the DCI Tour, providing even more opportunities for students to learn from the world's most elite marching music ensembles. These additional offerings from the corps are often hosted as single day events or sometimes even multi-day overnight summer camps.